Mask that gently exfoliates and detoxifies for ultimate skin purification. This mask gently exfoliates, detoxifies and removes impurities, leaving skin smooth, clear and bright. It can be used as an at-home treatment or incorporated into professional treatments for additional smoothing and detoxifying. 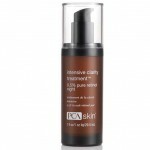 It nourishes rough, dull, dehydrated and stressed skin to promote a clear complexion. All skin types will benefit from this mask, with the exception of hypersensitive skin. Algae - detoxifies and hydrates skin. Clay – detoxifies and absorbs oil and impurities. Pumice (Micro-Fine) – helps to gently exfoliate skin’s built-up surface debris and impurities. Grape Seed Oil – contains a high content of polyphenols as well as the essential fatty acid (EFA), linoleic acid.